Home › Alarm Systems & Security › Burglar Alarm › CARCHET Central .. 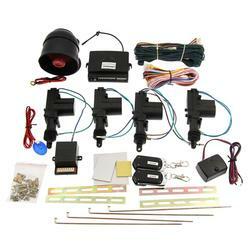 Car alarm and keyless entry security system. Two 4-button remote controls included. A built-in parking light relay included. Assist to activate remote keyless entry. Connection : Please refer to the instructions! * We showed the shipping time to customers, so don't leave us NEGATIVE FEEDBACK if your package arrived late, it is caused by shipping company. * Don't hesitate to email us if any questions, we will reply in 12 hours. * Don't open dispute or leave NEGATIVE FEEDBACK easily , trust us and email us directly , all the issues can be solved. then you will get the lowest price for your next order also with a free gift!! !And be our VIP customer forever!!! * You have 7 days to contact us and 30 days to return it from the date it was received. If this item is in your possession more than 7 days, it is considered used and WE WILL NOT ISSUE YOU A REFUND OR REPLACEMENT. * We do not allow refunds or exchanges because of change of mind. Please read all description provided as a guide before you bid. bad quality or products are broken during shipping(require clear pictures of products and packages). * Our goods are shipped all over the world,besides APO/FPO. * Orders processed within 4 days after payment is made and verification. * We only ship to confirmed order addresses.Your order address MUST MATCH your shipping address. please contact with us,we will offer you a best price. * SERVICE TRANSIT TIME is provided by the carrier and excludes weekends and holidays. * If you have not received your shipment within 45 days from payment, please contact us. * The shipping time during Holiday Season (Christmas, Chinese New Year etc) could be longer than usual time. Please add another 5-10 days as a delay. * We are not responsible for any custom duty or import tax. Copyright ©2019 Cheapest Car Electronics. All Rights Reserved.